NEW BRITAIN - After a five-year layoff the Governor’s Cup returned Saturday afternoon as select football players from Connecticut and Rhode Island lined up at Veteran’s Stadium in New Britain. With the heat bearing down on the field, it may have impacted the players but it certainly didn’t show on the field for the Connecticut group as it routed Rhode Island 28-7, dominating both sides of the football. Southington’s Tim O’Shea (Wagner College) finished the game with three catches for 46 yards and was on the receiving end of one of the three touchdown passes from the Offensive MVP of the game, Central Connecticut State University bound quarterback Kyle Zajack, who played high school football at Capital Prep. O’Shea believes the game being played in the summer months is beneficial for the collegiate bound players. In the first quarter there was some rust on both sides, as the two teams were playing a game together for the first time and the opponents were completely new faces from a different state. Rhode Island quarterback Nicholas Dionizio didn’t waste time taking his shot, though. He threw a dart to Zach Pezza for a 49-yard touchdown catch to put Rhode Island up 7-0 in the first quarter. There wasn’t much offensive action outside of the Pezza touchdown in the first quarter. With the first quarter over with and the jitters out of the way, Connecticut got going on both offense and defense. Zajack found Simsbury’s Ralph Gilliard streaking down the field for a big 64-yard touchdown pass on the first possession of the second quarter for Connecticut. Zajack’s pocket presence stood out throughout the game and he was clearly the best quarterback on either side. His backup Shea McManaway was forced from the game in the first half after taking a vicious hit. Zajack played the entire second half. Bulkeley’s Deyjion Washington intercepted Liam McManus for a pick six to give Connecticut the 14-7 lead going into the half. With the heat bearing down on the field Rhode Island and Connecticut were playing a defensive battle to begin the second half with three straight drives resulting in punts. The third quarter had no points but Connecticut wasn’t done offensively. 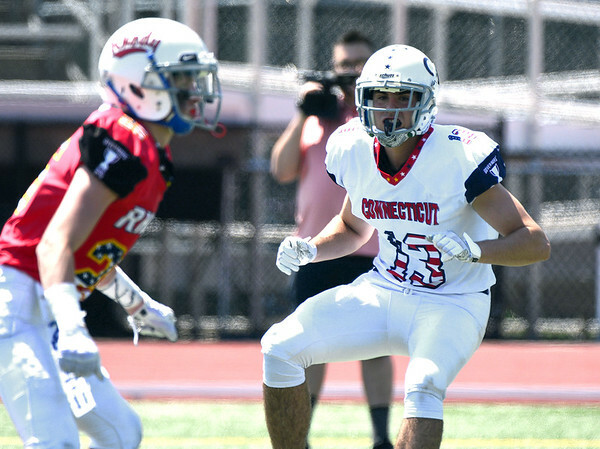 Connecticut drove down the field on its second possession of the half with some big plays from Killingly running back Spencer Lockwood, who flashed his ability to catch the ball out of the backfield on the drive with a 24-yard screen pass from Zajack and had a pair of first downs. Lockwood moving the chains resulted in Zajack’s second touchdown pass, a 20-yard strike to St. Joseph’s Jared Mallozzi with 10:24 left in the fourth quarter to make the score 21-7. O’Shea’s fourth quarter touchdown catch was setup by Mike Casinelli’s fumble recovery. Casinelli was named the Defensive MVP of the game for Connecticut. Posted in New Britain Herald, New Britain, Newington, Southington on Saturday, 30 June 2018 18:27. Updated: Saturday, 30 June 2018 18:30.